Northwestern Ontario is noted for its successful Ontario Bear Hunting experiences. The Black Bear population is estimated to be between 75,000 to 100,000 animals, one of the largest populations in North America. The Natural Resources Biologists tell us that Black Bear migrate to our private / exclusive black bear hunting area in large numbers from other areas miles and miles away. Perhaps it’s the abundance of berries, fruit trees in the area, or acorns that fall from the many Oak trees on our property that draw the bear here. It could be the large amount of vacated land with low pressure Black bear hunting here. Whatever the reason, you can almost choose your size and color of black bear on your Ontario hunting adventure. Brown or Cinnamon Bear Colour Phase, still a Black Bear. Adult female Black Bear typically weigh between 130-230 pounds, while male Black Bears are typically between 200 and 400 pounds. This is the largest black bear recorded in our large hunting area, a 650 lb dressed (already gutted) male Black Bear, and a 714 lb live weight, (whole bear, not gutted)bear was harvested nearby too. They are probably of very comparable size. The Black Bear hunting opportunity is excellent at our Resort. This camp was almost exclusively a black bear hunting camp that offered "World Class Black Bear Hunts", with success rates for Black Bear harvest always being high. This exclusive Black Bear Hunting Area is known to have a large bear population, with many bear of notable size and varying colors. We sometimes can provide "natural bear hunts" with experienced professional black bear guides, and we also provide baited bear hunting sites that ensure an excellent opportunity of success for all bear hunters. Our strategically placed bear stands are in carefully chosen spots within a good shooting range from our baits. Our Black Bear baits are active and are producing an influx of black bear to the sites. Your bear guide will take you to find a site of preference for you and your mode of hunting. You may choose your firearm: Archery or Bow, Rifle, Muzzle Loader or Black Powder. Whatever hunting site is chosen, an excellent opportunity awaits you to successfully harvest your trophy Black Bear. 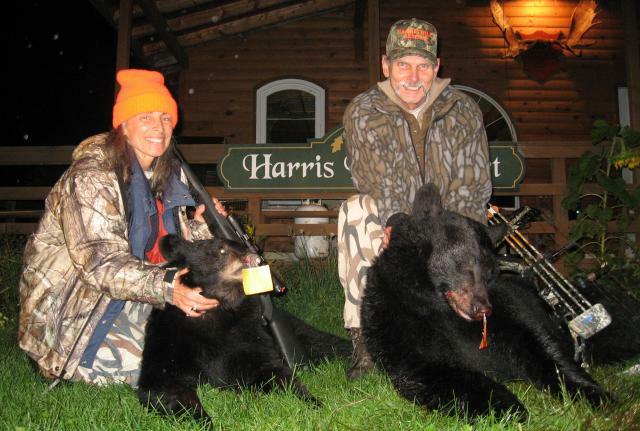 Our Bear Hunting Resort has a large and exclusive Black Bear Hunting Area. No one else can hunt in it except our Black Bear Hunting Guests.No matter what method of hunt you choose, archery, muzzle loader or rifle, your experienced bear hunting guide will be there to help you find that trophy Black Bear you are searching for. We are in Hunting Area 10.
our bear hunts are offered at end of August and in the beginning of September. We do not do Spring Bear Hunts as we prefer the quality of the hides in the fall and the bear are not crawling with wood ticks. Bear Guides do not hunt with you all day. Contact: 1-800-731-4000 or (705) 329-7662 or visit the Canadian Firearms Centre at http://www.cfc-cafc.gc.ca/info_for-renseignement/non-residents/default_e.asp . The printable non-resident firearm declaration form is available to view it and print it off, and have it completed before you get to the border.